Wow it's equivalent to the upside down jenny holy smokes I better buy it wow!!! An old friend has one that I graded 5.0 outside and 6.0 inside. Not that rare... But cool nonetheless. Well the rarest comic didnt sell so he's slashed price in 1/2!!!! I get it. I may have hyped it up a bit. At least I got people interested in it - and look, you're still following and sharing/promoting it. It is still a very, very rare comic. How many double cover X-Men #1's do you really think are out there? PS. You're supposed to tag with relevant keywords it so that it's easy to find. Not too many people go to eBay to search specifically for an X-Men #1 Double Cover. and how is peter parker bob barker DC batman etc etc etc 'relevant'? It's true. I never have seen anything like it before. Got it. I shouldn't sell it on my account because I don't have a history of selling comics. Should I just go ahead and sell it on someone else's account? Can I sell it on yours? So you 'came across this video' that YOU MADE? Don't get upset spoonful of sugar , your time will come. I'm just telling you the reality of the situation. 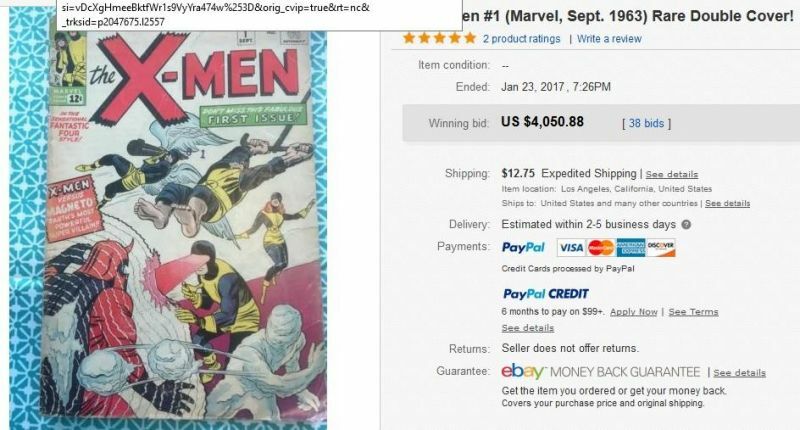 People are suspicious of first time comic sellers selling high dollar books. You may not be aware of it but there have been a huge number of fraudulent sellers on ebay trying to do this and we've exposed so many of them it gets boring. How many double cover X-Men #1's do you really think are out there?